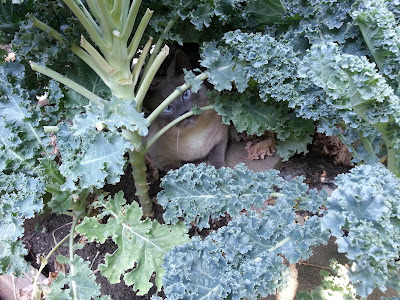 Who's this, lurking in the kale? It's Maxwell, Kale Guardian Extraordinaire! "I do believe this pepper plant could use some water, mom"
(in case anyone was wondering, this was one of Maxwell's occasional 'escape artist' moments. oh Maxwell, tu es beau! Beautiful pictures! Maxwell, I'm in love! Have a wonderful Wednesday and lovely pix. Maxwell is a very handsome kitty! Love the pics! Would be a good idea to put a collar with a bell on Maxwell? That way, you can hear him in the event he sneaks out. Today I saw a cat on the street who is likely to be deaf, judging by the way he didn't react even when I stopped my bicycle right behind him. Then bounced right up when he turned and saw me. Thank you so much for your efforts re Angel. We too just tried to help and were hoping things would be OK. Sad that it was not. However thanks again just for trying. Escape artist huh? Well, he seems to know his greens, all up close and personal! Why do I feel the need to sing the spam song but substitute kale?? Ah, let him have his sniffies. I pinned 1st pic. Merlin is blind and lives to sniff in the garden under close supervision. It sure looks to us like he is having a good time but probably needs to get back in that safe house. You do look terrific Maxwell.Nothing wrong with a little tip outside. Take care. Well it looks like you were having one kale of a good time! I haven't pulled that trick in a long time. Thanks for reminding me that I need to do it again. It's fun to explore. I think the kale stopped him in his tracks! I'm glad he got ushered in quickly! Great capture and lovely photos!! You look great among all that kale, Maxwell. Maxwell is so handsome! Happy Wordless Wednesday; thanks for hopping! 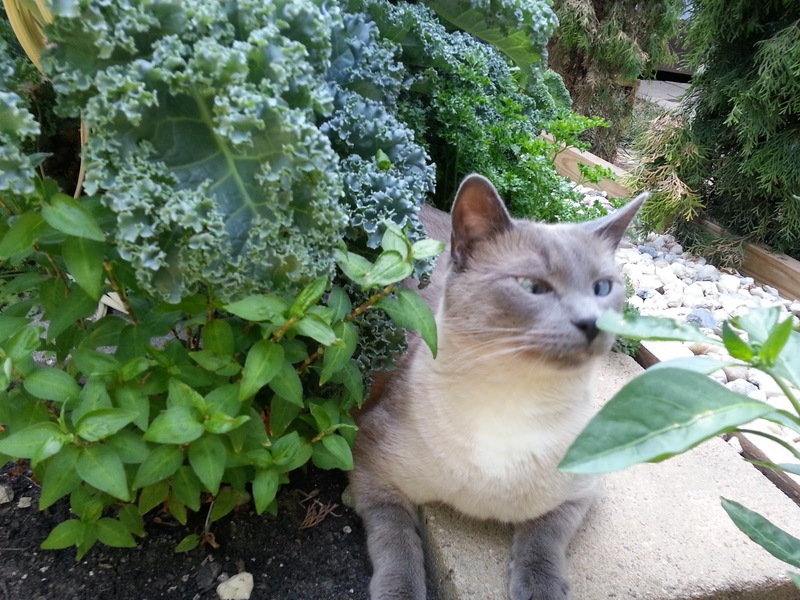 That's not nip next to the kale, is it? TW killed her indoor basil plant cos she forgot to water to yesterday. HAH! That blue Kale is gorgeous and really brings out your furs Maxwell glad you went back inside quickly to the house after the adventure. fantastic photo and I just love your kitties eyes. Wagging Wordless Wednesday! Is this 'kale' like NIP? Maxwell you are very naughty to run outside, but you look adorable in the kale!!! 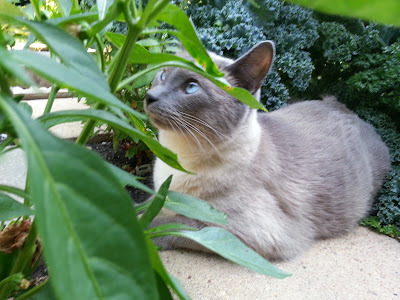 A mancat has to inspect his garden every once an again! Nice gardening tips, Maxwell!